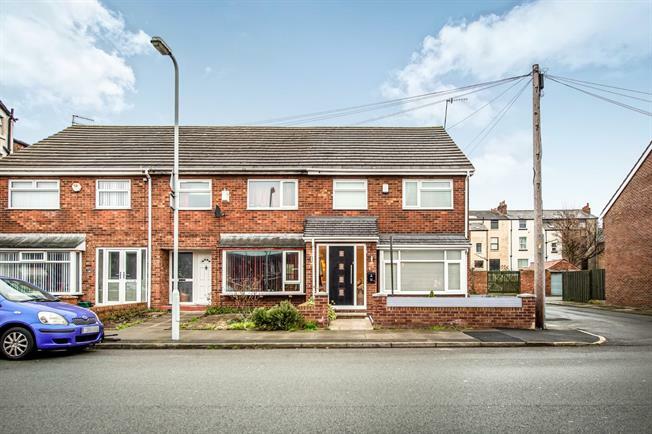 3 Bedroom End of Terrace House For Sale in Liverpool for Offers Over £175,000. Entwistle Green are presenting to the market this fantastic three bedroom family home. The property, in impeccable condition, briefly comprises; porch and impressive entrance hallway, lounge, open plan kitchen/diner, first floor landing with three bedrooms and a family bathroom. The property also benefits from an attractive front garden and rear enclosed garden with sunny aspect. This property must be seen to be fully appreciated. Tiled flooring. External Rock door. Entrance hallway with glass balustrades. LED stair foot lighting. Wood effect flooring. Cosy and modern front lounge. Double glazed uPVC window to front. Radiator. A range of fitted wall and base units with complementary work surfaces. Integrated fridge/freezer, oven, microwave, hob and extractor hood. Plumbing and housing for washing machine. Double glazed uPVC French doors and windows to garden. Double glazed uPVC window to rear. Radiator. Currently used as a dressing room. Fitted, mirrored wardrobes. Double glazed uPVC window. Radiator. Panelled bath with thermostatic shower over and glass shower screen. Low level wc. Wash basin inset vanity unit.. Tiled walls and flooring. Double glazed uPVC window. Heated towel rail. Attractive front garden with feature composite fencing. Rear enclosed garden, mostly laid to lawn with patio seating area. Timber shed.